Last time we looked at Broad Market index options. 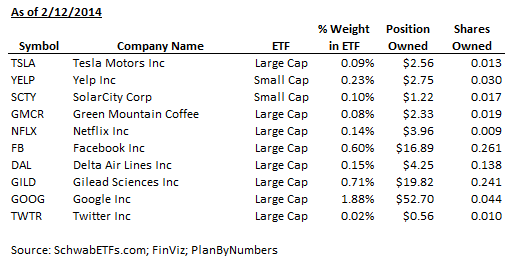 If you thought that was confusing, wait till we look at the landscape for ETFs based on company size. Let’s say you want to overweight mid and small cap because you have learned that they outperform large caps over the long run (albeit with increased risk). Besides, you want to be able to see the underlying portfolio blocks and rebalance between categories. 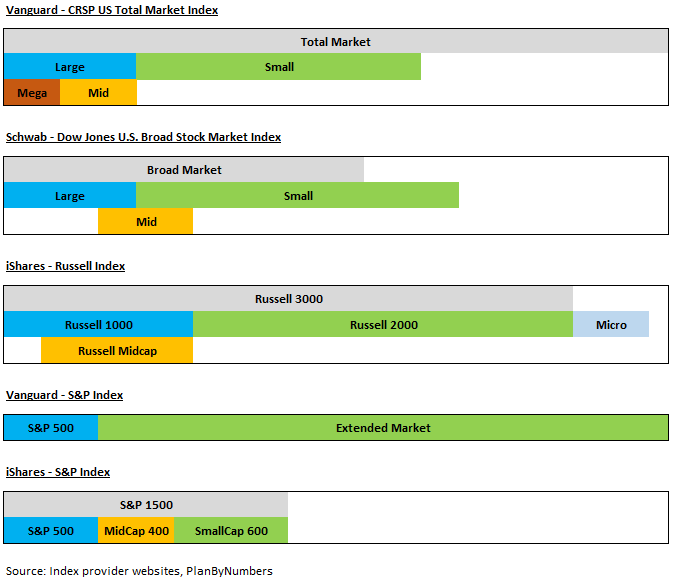 CRSP (Vanguard’s index provider) has done a great job describing various ways to split the market into size groups. Basically, you can slice the total market into either Two-Tier: Large + Small or Three-Tier: Large + Mid + Small. Of course ever-obliging ETF providers responded to investor demand by offering midcap options for even two-tier indexes. This and the sheer number of market cap ETFs created a confusing mess that we’ll attempt to decipher below. Exhibit 1 shows available index funds with important characteristics to compare them. I described the metrics in the Broad Market Index post but also added Annual Turnover % as a proxy for tax-efficiency and other hidden costs. Naturally, broad index funds have the lowest turnover while small and midcap ones make a lot of portfolio changes due to fluid nature of those categories. I also calculated the stats for a sample combination of large & small indexes for each family. This way you can compare the resulting portfolio to the corresponding total market fund. Exhibit 2 puts the same line-up into visual form to see how they jive together. It is built to scale based on a number of holdings in each ETF (3,500 being the highest – so we have 35 “notches” of 100 stocks each). One caveat is that the number of companies in the fund doesn’t reflect its true diversification. For example, ITOT’s 1,500 holdings is only 40% of VTI’s 3,700 stocks yet it covers approximately 90% of the U.S. market capitalization. Now, let’s review the line-up for each family. This point in bold is very important. I have seen this combination in quite a few portfolios. Let’s say if your goal was to overweight smaller companies and you allocated 60% to large, 25% to mid and 15% to small cap Vanguard funds. The resulting portfolio would double up on midcaps and actually be 55% large, 37% mid and only 8% small. Note that Vanguard’s high turnover ratio has to do with them switching from MSCI to CRSP benchmark in 2013 and it should be lower in the future. This is a solid offering, but once again you have to be careful with midcap component (Exhibit 2). It actually overlaps both large and small funds and is not necessary to create a total market portfolio. At my firm we typically use 75% SCHX / 25% SCHA for domestic equity – it’s very cheap (5 basis points for the combo), funds are very sensibly constructed and there are no transaction costs at Schwab. Despite being the most expensive option, this is another popular stable of funds with great market coverage. Midcap fund is once more superfluous and completely overlaps with Russell 1000. 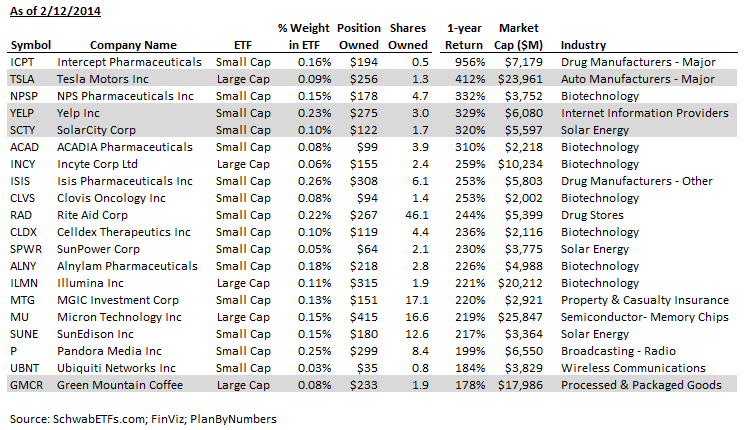 Unique to this line-up, Russell offers a micro-cap option if you are interested in the very smallest public companies out there. Be careful though as IWC has a high expense ratio and can run into liquidity issues with some of their holdings. This is an elegant two-fund solution that covers the TOTAL stock market with the highest number of holding in our combinations. It’s also quite cheap and has very low turnover. S&P index scheme is probably the best-known to the general investing public. It’s a clean three-tier option and is a decent choice despite the relatively low number of holdings. Interestingly, turnover is much lower here as the indexes membership is managed by committee and not quantitative rules. Also note that SPDR has competing offering with SPY, MDY and SLY but not a total market option. You wouldn’t believe how many times I have seen real-life portfolios that mix funds from different providers in an attempt to cobble together “total market” exposure. People look at the fund names and assume that large, mid and small funds are exactly that and are interchangeable. Exhibit 3 shows couple examples of this creative splicing. Clearly there are lots of gaps and overlaps! The second example is a very common one – after all SPDR S&P 500 (SPY) and iShares Russell 2000 (IWM) are synonymous with large and small cap stocks, respectively. In fact, among all ETFs they are number one (112 million shares per day) and number three (48 million) by average trading volume (EEM is number two in case you were wondering). So let’s take a quick look at the results of combining these two instead of using Russell 1000 and Russell 2000 together (Exhibit 4). You would miss out on a number of well-known names such as Las Vegas Sands, Tesla and LinkedIn (although you might be happy to be out of TSLA today (5/8/14) as the stock is down about 10% on earnings). 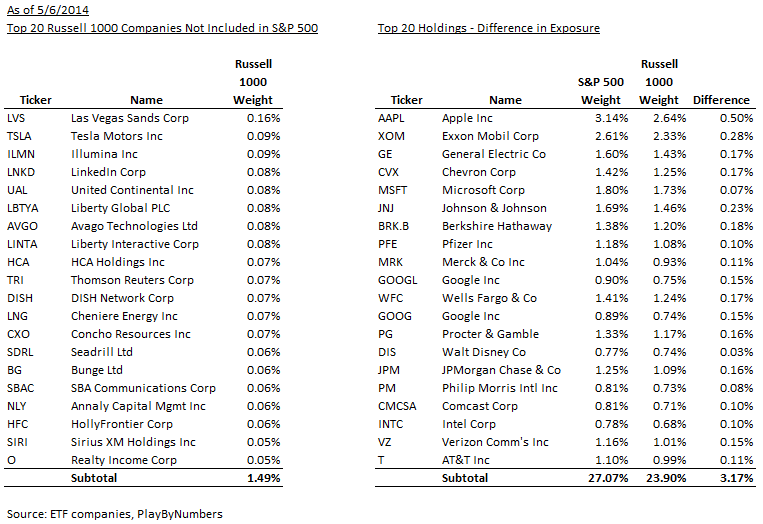 Moreover, the top names in S&P 500 would be overweighed relative to Russell 1000. This entry was posted in Indexing, Investing and tagged index, indexing, large cap, mid cap, russell 2000, S&P 500, schwab, small cap, total market, vanguard on May 8, 2014 by Denis Smirnov. Along with the rise in overall passive investing on the rise (Exhibit 1), domestic equity space has seen a large increase in indexing. I decided to do a series of posts looking at various index options. I will start with a deep(-ish) dive into the available broad market index funds. By the way, S&P 500 is NOT a broad market index – it’s a managed index of 500 large companies and excludes over 2,500 other stocks available in broader indices. And don’t even get me started on Dow 30 as a market benchmark! Let’s say you have read many articles on Morningstar, Vanguard and lots of other sites that convinced you that indexing your domestic stocks is a way to go (trust me, it is). You decided to replace your actively-managed funds with a broad market index and be done with it. So what is the best option to use and why? 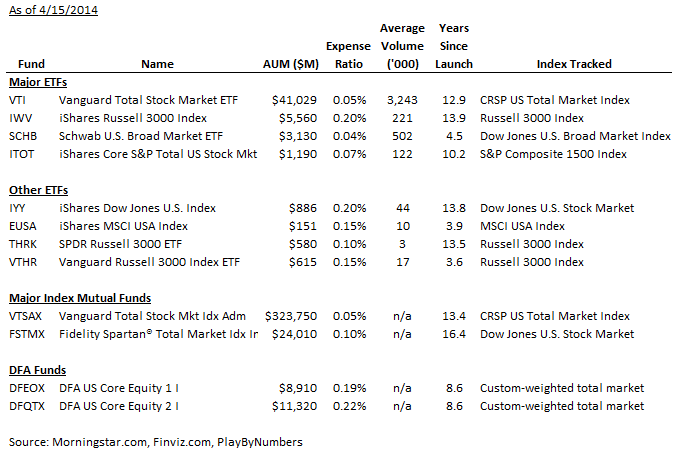 Exhibit 2 shows most of the major ways to buy the entire U.S. stock market in one fund. There are several sub-sections in the spreadsheet. 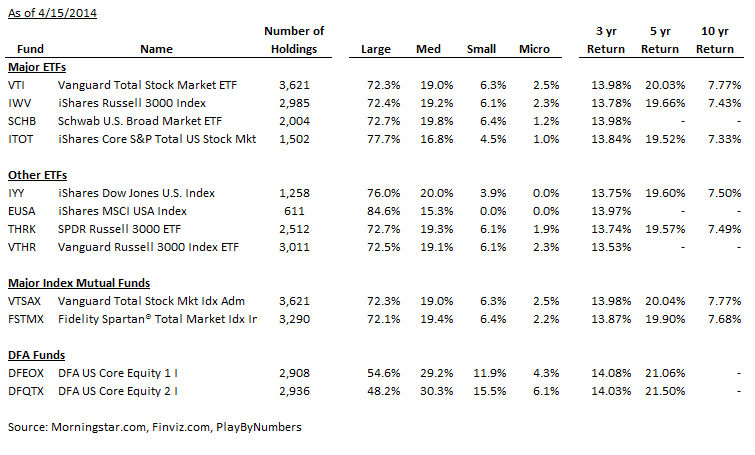 Major ETFs represent large funds tracking four main indices. Other ETFs are shown for reference, they wouldn’t be my first choices. Interestingly, iShares has FOUR different broad market ETFs tracking different indices. Seems a bit overdone to me, but that’s why I’m not an important fund company executive. Also, there are two other Russell 3000 funds from SPDR and Vanguard, but iShares version remains the biggest one despite having higher expense ratio. I also showed a couple of major open-ended mutual funds that represent the total stock market. 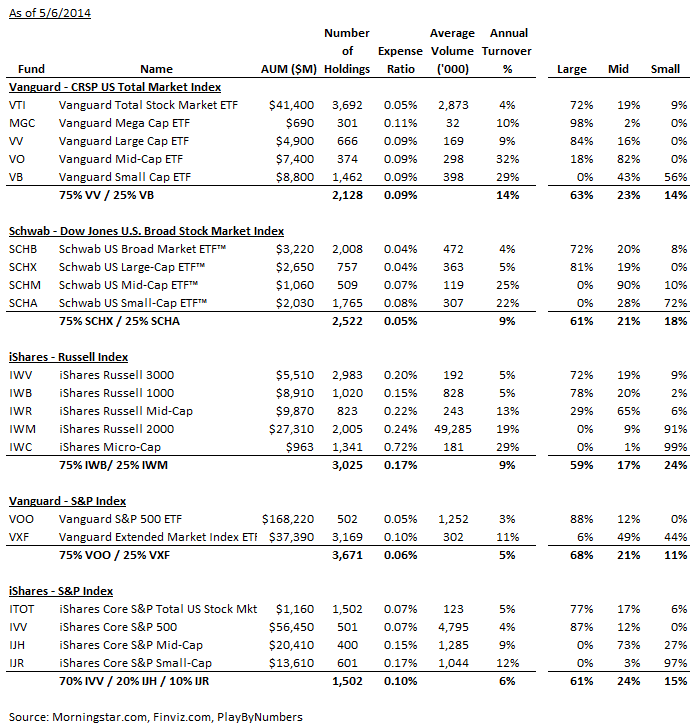 VTSAX is a different share class of VTI (note that AUM for VTI represents ETF share class only). Just to be thorough, I also included two funds from Dimensional Fund Advisors. They are not index funds per se – they use custom benchmarks that overweigh small cap and value stocks based on academic research. I might do a separate DFA post at some point, but this article will focus on funds that track actual commercial indices. Assets Under Management (AUM) – Typically, higher AUM reflects an established fund that attracted a lot of assets with low fees and solid management (Yes, managing index funds DOES require large amount of expertise). Expense Ratio – This one is pretty simple – lower is better! Average Volume – ETFs (as opposed to mutual funds) are traded intraday, so you want to pay attention to how liquid they are. Personally, I wouldn’t use market orders on anything that trades less than 100,000 shares a day (200,000 just to be safe with all those high-frequency traders – 60 Minutes anyone?). Benchmark Index – Note that fund companies listed above maintain arm’s-length relationships with index providers. They license the right to use the index name and track its holdings. There are five primary U.S. index providers represented. Standard & Poors is a well-known index shop as is Dow Jones. Interestingly, these two formed a joint venture in 2010 and their indices are part of the same business now. MSCI is a provider more known for its International indices. Moreover, MSCI USA is really a large cap index as opposed to the broad market as it has no exposure to small stocks. From investor’s perspective, the actual underlying index is not too important as long as it’s broad enough, but some index providers charge high fees that lead to higher fund expense ratios (see Vanguard’s VTI vs VTHR). Now let’s take a look at some portfolio composition metrics and historical returns for these funds (Exhibit 3). Number of Holdings – In a broad market index you want as many positions as possible, while still remaining practical to manage. Thus VTI and IWV are great choices and EUSA not so much. Another thing to note is index sampling – i.e. holding “representative” securities that get the returns “close enough” to the underlying index. For example, THRK’s benchmark is composed of 3000 companies, but the fund has only 2,512 holdings. Similarly, SCHB has 2,000 holding vs 2,500 in its benchmark. Sampling, if done well, keeps costs low by reducing the fund’s transactions. Composition by Market Cap – related to last datapoint. You DO want significant exposure to small and micro caps since they tend to outperform larger companies over time. The top three major ETFs are very comparable in this metric. Historical Return – For index funds, this is largely a function of low expense ratio. But index tracked, management experience, trading costs and other variable play significant roles. Expense ratio – check (although its 1 basis point higher than Schwab). 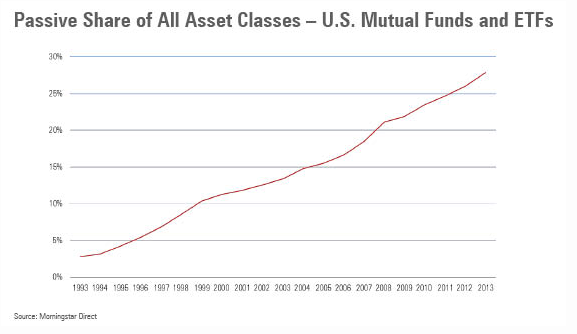 Time in existence – the fund has been around for almost 13 years and Vanguard has been managed indexed funds since 1970s. Historical Performance – best index fund returns over all timeframes (again DFA is better but with quite a bit more risk). Largely due to very low expenses, but the performance advantage holds even after adjusting for expense ratios. This entry was posted in Indexing, Investing and tagged broad market, crsp, index, indexing, russell 3000, schwab, vanguard on April 16, 2014 by Denis Smirnov.